In lieu of flowers memorial donations may be made to the Ghana Project and left at the funeral home. Lee Etta Marceline (Brown) Witt of El Dorado Springs, MO, died July 5, 2016. Lee Etta was born on June 4, 1928, at Pleasantview, MO. Preceding her in death were her husband Lester; her parents Glenn and Effie Brown; her brother James; her daughter-in-law Judy; and her granddaughter Tonya. Survivors include two sons, Lonnie Witt and wife Leta of Gravette, AR, and Larrel Witt and wife Janice of El Dorado Springs, MO; grandson Luke Witt and wife Dorothy, and four sons of Gravette, AR; grandson Lyle Witt and wife Michelle, and two sons and two daughters of Cincinnati, OH; granddaughter Lisa Profitt and husband Aaron, and three sons of Cincinnati, OH; grandson Marcus Witt of Mission, KS; granddaughter Oleta Witt of Ghana, Africa; two sisters-in-law Loriane Sands of Lockwood, MO, and Dorothy Witt of Kansas City, MO; and a number of nephews, nieces, and a host of friends. 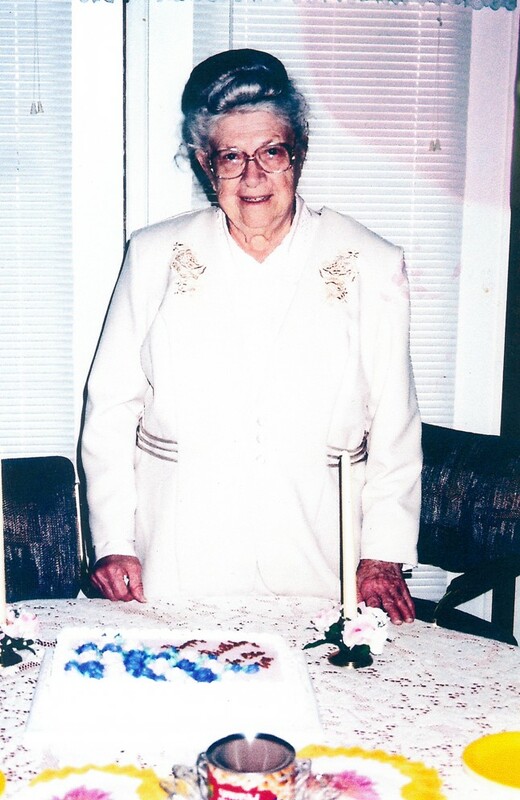 Funeral services for Lee Etta Witt were held on Saturday, July 9, 2016, at 10:00 a.m. at the El Dorado Springs Church of God (Holiness), with Pastor Joe Trussell officiating. Music was provided by Wanda Casey, Luke and Dorothy Witt, and Lyle and Michelle Witt. Interment followed in Love Cemetery under the direction of Bland-Hackleman Funeral Home. Pallbearers were: Luke Witt, Lyle Witt, Marcus Witt, Aaron Profitt, Neal Sands and Jason Moomaw.